Hyundai Heavy Industries, the world’s biggest shipbuilder and offshore facilities contractor announced today that the Company completed developing its own Hyundai FLNG (Floating Liquefied Natural Gas Plant) model in association with Linde AG, an international industrial gases and engineering company of Germany. The Hyundai FLNG has an annual production capacity of 2.5 million tons of LNG and can store about 193,800 m3 LNG with its compact size of 355 m in length, 70 m width and 35 m in height. The FLNG, existing only as a concept as for now, is a special floating vessel that can produce natural gas, liquefy it, and offload it directly to an LNG carrier. Hyundai Heavy conducted risk and safety evaluations of the FLNG and received the approval-in-principle from the Norway’s DNV. The FLNG consists of hull and topside facilities. The topside includes not only liquefaction and pre-treatment units but also utilities such as fresh water supply unit, the air compression, heat source and power generation systems. The development of Hyundai FLNG makes Hyundai Heavy the only company in the world that can conduct engineering, procurement, installation and commissioning for both the topside and hull part. Since Hyundai FLNG takes 25% less time to build compared to the onshore liquefaction and storage plant, the offshore plant could be an attractive option for oil majors and global shipping companies looking to commercialize stranded gas in offshore fields. 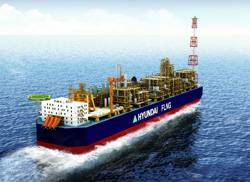 “Hyundai FLNG has an efficient and economical production capability in that it just takes about 45 months to build. Considering the fact that the need for the development of stranded offshore gas fields is expected to be on the rise down the road, we will continue to step up our effort to win orders to build Hyundai FLNG,” said Mr. Kim Yoon-choon, senior vice president of Hyundai Heavy’s Offshore and Engineering Division who is the charge of the FLNG development project. Since the high oil prices and steep increase in the natural gas demand triggered by Japanese nuclear disaster boost the need for the development of offshore gas fields, the FLNG market is expected to grow further. In addition, Hyundai Heavy Industries was selected as a core institute for the development of FLNG system engineering by the LNG Plant R&D center of KOGAS. The goal of the project is to develop the Korean FLNG by 2016. Ulsan, Korea – January 5, 2012 – Hyundai Heavy Industries, the world’s biggest shipbuilder and offshore facilities contractor announced today that the Company completed developing its own Hyundai FLNG (Floating Liquefied Natural Gas Plant) model in association with Linde AG, an international industrial gases and engineering company of Germany. The Hyundai FLNG has an annual production capacity of 2.5 million tons of LNG and can store about 193,800 m3 LNG with its compact size of 355 m in length, 70 m width and 35 m in height. The FLNG, existing only as a concept as for now, is a special floating vessel that can produce natural gas, liquefy it, and offload it directly to an LNG carrier. Hyundai Heavy conducted risk and safety evaluations of the FLNG and received the approval-in-principle from the Norway’s DNV. The FLNG consists of hull and topside facilities. The topside includes not only liquefaction and pre-treatment units but also utilities such as fresh water supply unit, the air compression, heat source and power generation systems. The development of Hyundai FLNG makes Hyundai Heavy the only company in the world that can conduct engineering, procurement, installation and commissioning for both the topside and hull part. Since Hyundai FLNG takes 25% less time to build compared to the onshore liquefaction and storage plant, the offshore plant could be an attractive option for oil majors and global shipping companies looking to commercialize stranded gas in offshore fields. “Hyundai FLNG has an efficient and economical production capability in that it just takes about 45 months to build. Considering the fact that the need for the development of stranded offshore gas fields is expected to be on the rise down the road, we will continue to step up our effort to win orders to build Hyundai FLNG,” said Mr. Kim Yoon-choon, senior vice president of Hyundai Heavy’s Offshore and Engineering Division who is the charge of the FLNG development project. Since the high oil prices and steep increase in the natural gas demand triggered by Japanese nuclear disaster boost the need for the development of offshore gas fields, the FLNG market is expected to grow further.